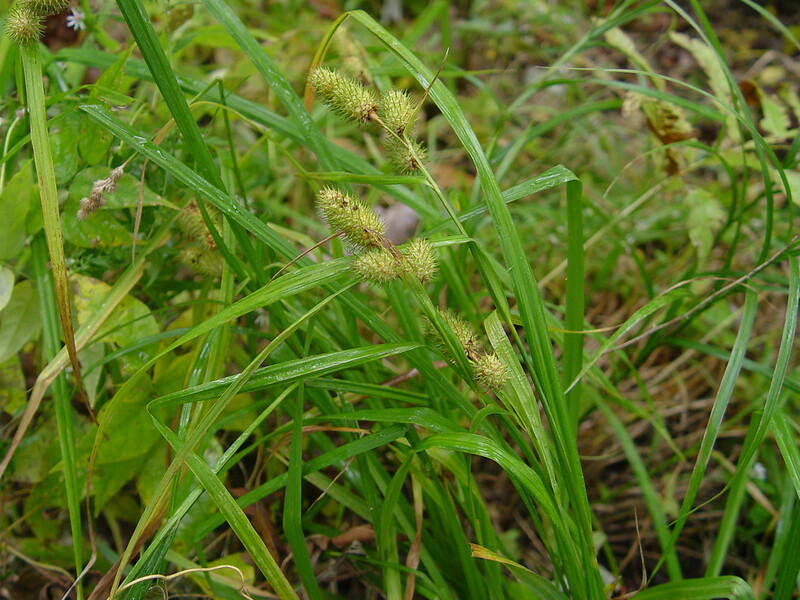 Carex typhina. By Donald Cameron. Copyright © 2016 Donald Cameron.New England Wild Flower Society.gobotany.newenglandwild.org (Accessed 4/2016). Sedge 30-90 cm tall, robust, densely clumped; ligules longer than wide. Leaves alternate, gray-green, lowest ones nearly bladeless (aphyllopodic), upper leaves0.5-1 cm wide, the uppermost longer than the inflorescence. Flowers in 1-6 dense spikes 2-4 cm long, 1-1.5 cm wide, each subtended by a leaf-like bract; male flowers below females on each spike; female flowers papery, male and female flowers separate (monoecious) on the same inflorescence, female flower is composed of a sac-like perigynium, without petals or sepals, the top of the perigynium is open and is often extended into a beak. Males flowers scale-like. Frequency in NYC: Rare, threatened in NYS..
Habitat: Wet woods and calcareous wet meadows.